Do you want to make sure your site is really protected? Do you want to be sure that your security plugin works well? Do you want relaxed sleep? 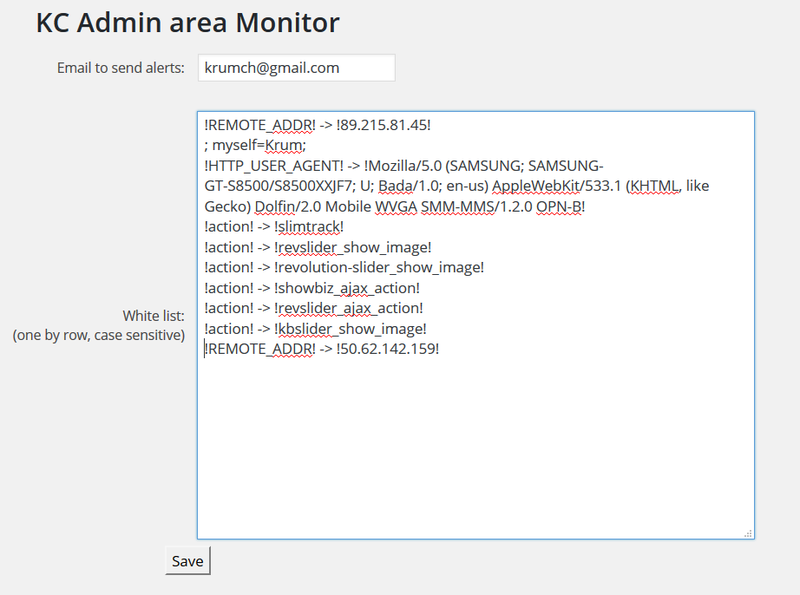 “KC Admin area Monitor” (or KCAM) does exactly what it says, literally. This is your "security camera" in your dashboard. You may set security plugins, but did they really works? This plugin don't try to protect you, just gives you clear vision on what happens in your dashboard. Plus gives you info about plugins what are vulnerable. This plugin is for at least "middle techy" developers or site owners, as works with "too raw" info. This plugin is a "security camera" only, passive registering tool, not a "guard", active protection tool. Whitelisting blocks only messages to you, not the work of your site, theme and plugins. When anybody sends a request to your WordPress dashboard, you will get a mail. There in mail will be all the info about this request: call stack, _REQUEST and _SERVER arrays, and a message from the plugin. Messages will be only two: "KCAM options saving" or "Alert". Note, it sends emails on EVERY request, include your activity in the admin area and saving his own options. That is because plugin can not recognise "you". To not be flooded with emails, you must set the whitelist. Means, copy some unique string (in "Usage" section you will find examples) from the email you got from it, put in whitelist and you will not get emails that have this string inside. In the screenshot I set (row by row) my IP, a marker from another tool of mine, my mobile user agent (as it can have lot of IPs, can not set them all), "action" from the logging plugin, several actions from intruders, all they mimic plugins I don't run, so they are not menace for me, and finally, my server's IP, sometimes wp_cron uses it. Now I get only alerts about some plugins, that allow cracking, or when some intruders try some URLs, without to know the structure of my site. With that info I can do something to protect my site. I ban IPs of "most motivated" intruders, change plugins, even consult others what plugins to avoid and find viruses in other people computers just because they saw some pages on my site and viruses run scanning on the site right away, without their knowing. Nothing special, just a generic installation. You must set it in admin area, please find a new row "KC Admin Monitor" in "Settings" menu. Fill the "whitelist". See detailed description about that in next chapter. Looks scary? Nope, that is only the info of a HTTP request. Someone scans my site for some old bug... This is the full list of data, what the server knows about the request. Check if this is your IP (I use Infosniper or WhatIsMyIP). Then put in whitelist and you will not get email alerts for your activity. Do same for other admins in your site, if any. and put it in the whitelist. Note that there can be lot of requests with this parameter, and this will hide all of them. This way you create your whitelist (each string/rule alone on a row). Set unique strings for each action you want to skip the alert, to be sure you will mute the exactly action you know that is not a problem for your site. Avoid HTML tags - they will be deleted. Please check my own settings at "Screenshot" tab bellow. If you do a mistake, save wrong row or so, you won't do any harm on your site. All the requests will be executed, not suspended, in any case. This plugin is a "security camera" only, passive registering tool, not a "guard", active protection tool. You block only messages to you, not the work of your site, theme and plugins. It will work well with any plugin, include your security plugins. Actually, you can check how well works your security plugins, using this tool. Ask me, I will answer. In the screenshot I set (row by row) my IP, a marker from another tool of mine, my mobile user agent (as it can have lot of IPs, can not set them all) on 3 rows, "action" from the logging plugin, several actions from intruders, all they mimic plugins I don't run, so they are not menace for me, and finally, my server's IP, sometimes wp_cron uses it. This plugin is released under the GNU General Public License v2, or any later version. This entry was posted in WordPress plugins and tagged activity log, admin connections log, admin security, check tool, dashboard security, log, log tool, risk prevention, security, security camera, security check, security log, security prevention, security tool, self protection. Bookmark the permalink.